I found out that Commissioner Benepe has some wrong information himself. I’ll report back on that later today or tomorrow. 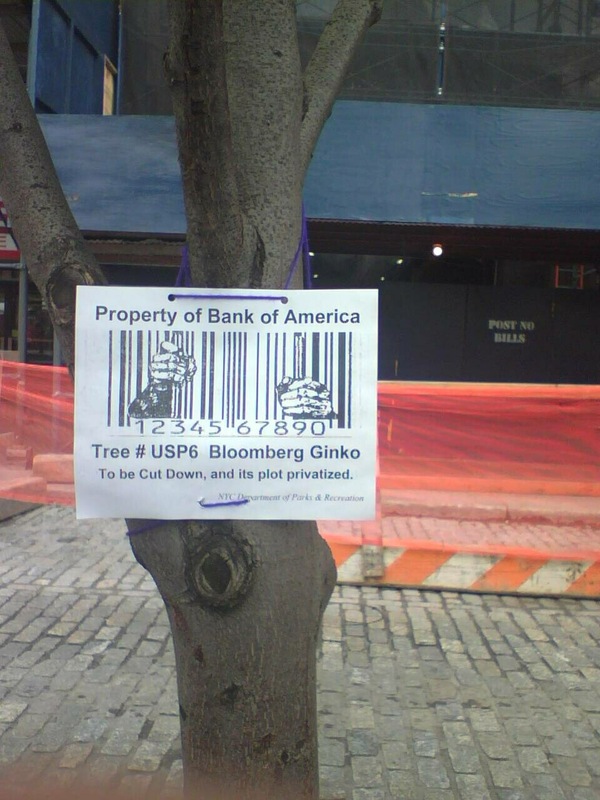 An Arbor Day protest on Friday, April 25th in Union Square Park united artist/vendors with tree-savers and bike riders around the theme: Stop Privatization of Public Space / Protect Our Trees. Artists, performers, eco-activists and community members leafleted the thousands of people streaming through Union Square Park with information about what’s happening in our city – the mass cutting down of trees in our parks, the privatization of public space, and reduction of public space – under the auspices of Mayor Bloomberg. Many of the Washington Square Park activists who have worked so hard and for so long to help that Park came out in support of protecting the trees and stopping the privatization at Union Square and in our City overall. I met some WSP blog-readers too! Members of the Bronx Treekeepers arrived with a new petition and collected many signatures as we circled the Square. We approached – and were approached by – numerous people (including people playing Twister on the plaza who held the flyer in their mouths so as not to lose their positions!). They all wanted information on how Mayor Bloomberg is encroaching on our public space and his tree destruction (despite his MillionTreesNYC p.r.). The information that 14 trees were going to be chopped down to make way for a private restaurant left people aghast. There were other protests going on that evening — notably the Sean Bell verdict protest in Queens had been called for the same time — so we knew that many activists who would have attended had headed over there, understandably. The Park itself was abuzz that night with all sorts of political and artistic projects. “Free Tibet” protesters set up one hundred white candles encased in glass containers all along the Main Plaza. 9/11 Truth activists collected signatures. Musicians, dancers, tourists, pounded out the cadences of a new counterculture emerging. Union Square on Arbor Day: It was an amazing tribute and example of a great use of public space. Thank you to Rebecca, Mitchel, Robert L., Elizabeth, Gloria, Joel K., Tony, Miriam, Ned, Alex, Ernie, Jessie, Sharon, Linda, Carl, Kevin, Suzannah, Susan (and partner), Ben, ALL the street artists, and anyone else I inadvertently left out for your help, support, and great activism around this event.